This chart shows the average number of Simpsons viewers by season for the past 30 years. Recently, the Simpsons passed the impressive milestone of 30 years on television. Two years after the dysfunctional but loveable family from Springfield made their first appearance on the Tracey Ullman Show on April 19, 1987, Fox handed The Simpsons its own program. Since then, it has grown to become an American institution. Whether or not it will still be around to celebrate another 30 year run is an intriguing question. 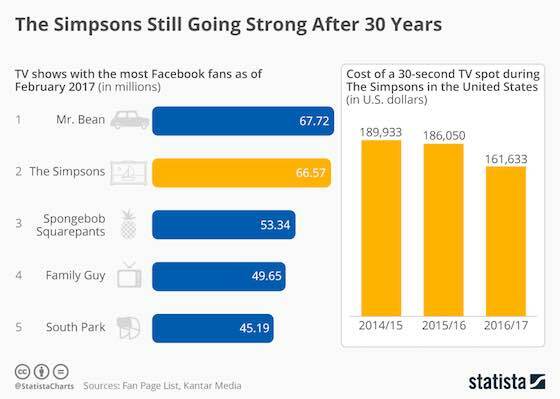 In its earlier seasons, the The Simpsons did very well in terms of its average viewers. More recently however, Springfield has started losing that spring in its step with its viewer base eroding significantly. According to Nielsen, season 27 had an average of 4 million viewers while season 17 had over double that number. The decline in ratings may not be due to the show and its cast of characters, however. These days, viewers have a much bigger selection of content to browse with seemlingly endless ways to watch it. 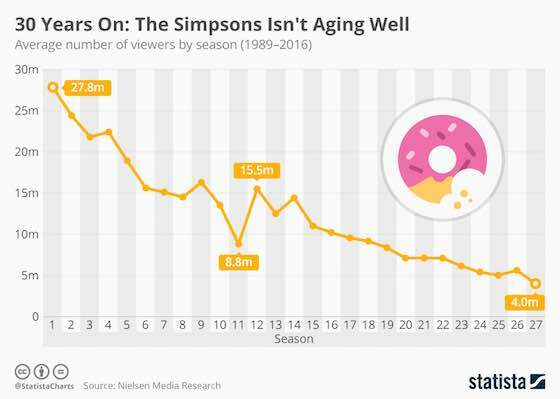 With the onset of Netflix and on demand content, it may well be that The Simpson's viewership decline is a natural result of this trend. The yellow bunch from Springfield doesn't seem to have lost much of its appeal. If you measure audience dedication by Facebook fans they are just behind Mr. Bean. Costs for TV spots aired during the show are on the decline, but are still going pretty strong overall. Some believers argue that watching the Simpsons can provide you with a realistic general education. Video: "30 Years On: The Simpsons Not Aging Well"